Ever so often, I like to share what’s on heavy rotation on my iPod. It isn’t always the newest thing, or the most popular thing, but for some reason this is the stuff that I’m grooving to. I make no distinction between idol and non-idol Kpop, popular and obscure, mainstream and indie. It’s just what I like, and some info about it. Maybe you might like it too. It’s probably clear by now that I’m an omni-Kpop fan: I’ll listen to practically anything, and I’m always looking to expand my horizons. I already had some Dynamic Duo, but not nearly as much as I thought I should have, so I just downloaded a bunch-0-stuff from Soribada (’cause you know, I like to keep it LEGAL). This go around, it’s Chulchek, by Dynamic Duo, featuring Na-Ul of Brown Eyed Soul. This track comes from their 2007 release, Enlightened. 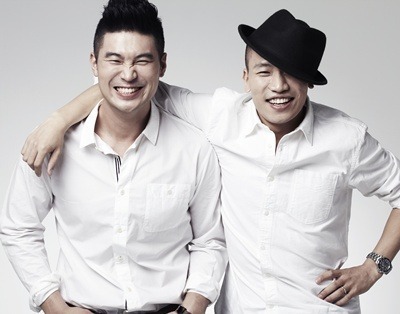 Dynamic Duo is made up of two guys, Choiza and Gaeko. After their success with their second album, Double Dynamite – Operating Manual, they formed the record label Amoeba Culture. They are also part of a Korean hip-hop crew, The Movement, that includes the likes of Epik High, Dok2 and Tiger JK. I remember that I tried really hard to get the nominated albums of American Music Awards such as, THE NOTORIOUS BIG’s BIG POPPA, 2PAC’s DEAR MAMA, and WARREN G’s REGULATE, back in my elementary school. I recorded the Awards ceremony and watched it hundred times. I think 90s Hip-hop inspired us a lot. . . . we don’t think we have to mention about Stevie Wonder’s music, but his passion that makes him continually working as an artist even after he achieved everything is very inspiring. Although we cannot be such a great artist as he is but we can be the artist who are continually working hard. We would say Al Green and Marvin Gaye’s music is the root of our music. Codes, scale, singing style and the feelings of melody are all influenced by their music. I LOVE this song…it was on heavy rotation from the minute I downloaded it. I like it for a couple of reasons. First, it has that old-skool vibe to it, and I LOVE old-skool. The baseline reminds me of some 1970s funk, that makes it very groovy. The other reason why I like it should be clear: Na-Ul!!! I love Brown Eyed Soul, and the combination of his vocal is a nice contrast to the stronger rap of Choiza and Gaeko. This song is infectious from the get-go, and reminds me of a time when hip-hop was about the party. It’s a fun song, and I love blasting it in the summertime while I drive.